Bang & Olufsen is a company that’s world renowned for producing luxury-class audio equipment at a price that few can afford. Lately, they’ve blessed us with the Play line – a series of speakers and headphones that provide sound quality that’s well above average, at a price that’s much lower than most of their offerings. While the B&O Play speakers give you a taste of what they have to offer, the only way to get the real deal is with a fully-fledged BeoSound speaker. Customers are willing to pay a premium in order to enjoy B&O’s signature sound, something that has been refined for decades. 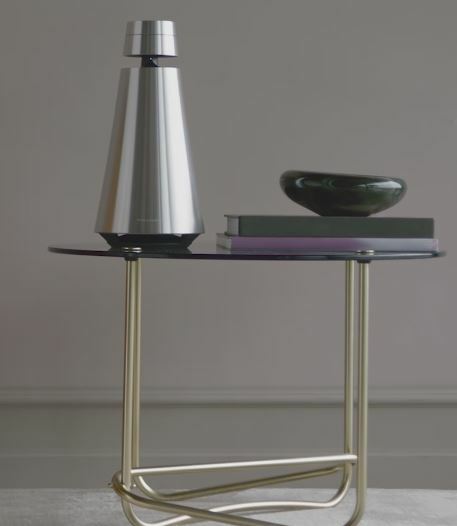 BeoSound speakers are unique in both form and functionality, with every member of the family adding a unique twist to the comparatively bland personal audio industry. 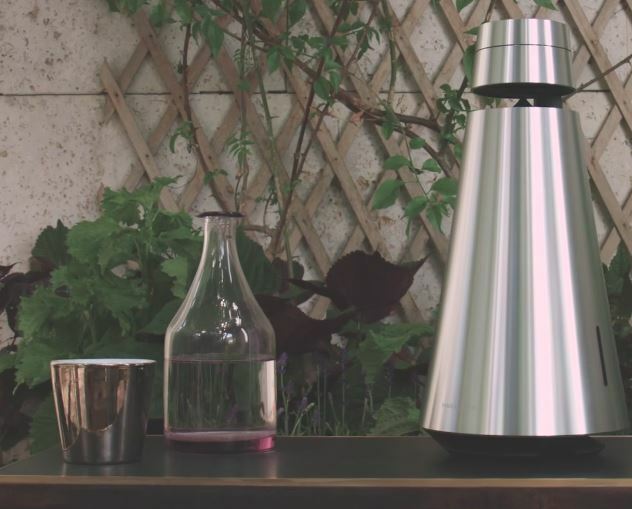 We had the opportunity to try the stunning BeoSound 1 Portable Speaker out for ourselves. We’ll go in-depth and find out what it can do, so you can decide if it would make a nice addition to your home stereo system. From the moment we opened the box, we knew that the BeoSound 1 was far from ordinary. Designed and built in Denmark, the material design of this speaker is what stands out the most. With craftsmanship beyond anything you thought possible, this speaker is certainly going to be a conversation starter at your next dinner party. But the lines between form and function aren’t quite as defined with the BeoSound 1, as many of the visually appealing elements also serve an acoustic purpose as well. The BeoSound 1 is comparable to a standard speaker the same way a Ferrari is comparable to a Ford. Even when the speaker is not in use, it still functions as a work of art. 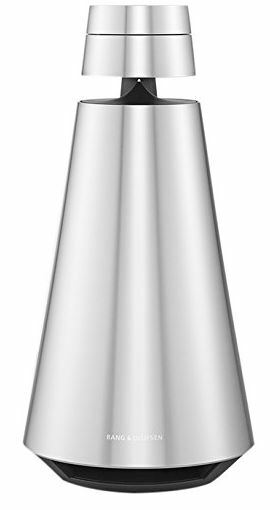 The conical aluminum enclosure would be right at home in the ultra-modern interior of a billionaire’s home, or the minimalist halls of an art gallery. Although it is certainly going to occupy your attention, it’s compact size means that it won’t occupy more than its fair share of your space. It’s small enough to be placed on a coffee or side table, and adaptable enough to produce incredible sound no matter where you choose to place it. The speaker is divided up into three separate components. The majority of its mass is used for the bass driver. It’s 10cm in diameter, and stored in the bottom of the speaker. 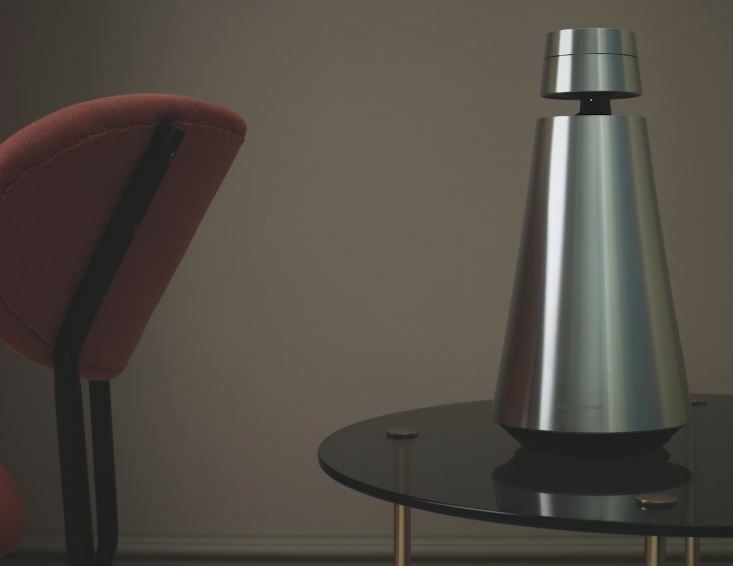 It faces directly towards the ground, with a conical dispersion plate allowing the low-end sound waves to travel along the floor in all directions. The space behind the driver is hollow, providing the air-mass necessary for deep bass extension. The top of the speaker appears as if it’s floating above the base. In reality, it’s connected solidly by a large cone, but the visual effect is striking. Underneath, a peaked dispersion cone stands like a mountain, projecting the sound waves in all directions. Above it is the 4cm driver, which provides the upper end of the speakers range. Finally, the top of the device is capped with a control dial. With only a single LED in the middle, it’s strikingly minimalist. But when you place your hand on it, the smooth motion and subtle notches are sure to make you appreciate the attention to detail that went into building the BeoSound 1. After unwrapping a speaker that looks as if it came from another planet, you can imagine how excited we were to hear how it sounded. The first thing we noticed was how evenly the sound was dispersed around the room. You’ve probably noticed that almost every speaker on the market has a sweet spot. With some, you have to be sitting directly in front of it to get the best sound quality. Others are more flexible, but you can always hear which direction the sound is coming from. But the BeoSound 1 was unlike anything we’ve heard before. Sound didn’t even seem to come out of the speaker. Instead, it seemed to come from the room around it. It is, by far, the most convincing 360-degree sound effect we’ve heard to date, and that includes high end 7.1 channel surround systems. As for the sound itself, we caught ourselves turning it up much louder than we typically do. 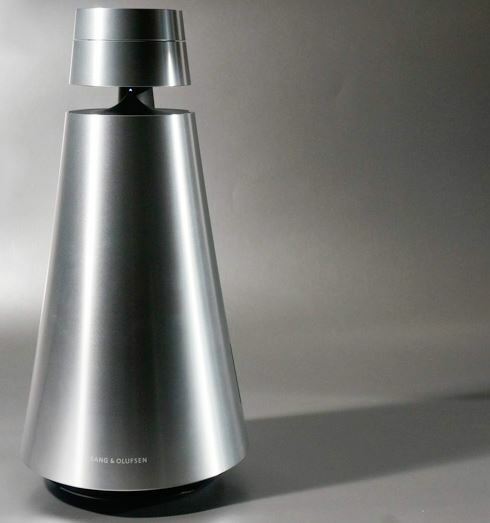 While most speakers become punchy, aggressive, and shrill at high volumes, the BeoSound 1 sounded so much more natural. Although we were still standing in the same room, it felt as if we had been acoustically transported to another place. The sound was incredibly smooth, and all of the frequencies were harmonized into a single audible image, as if the musician was performing right in front of us. Where these speakers really excel is at picking up the subtle nuances of a song that you may not have been exposed to before. The textured feel of a guitarists hand sliding up the fret board or a slight wavering of a vocalist’s lyrics after holding a difficult note are clearly defined, which gives the music a raw, organic feel to it. This was very much unlike your typical studio speakers, which play back audio in a flat, analytical way. Instead, it was as if our music was being interpreted by the speakers, adding a unique artistic flair. 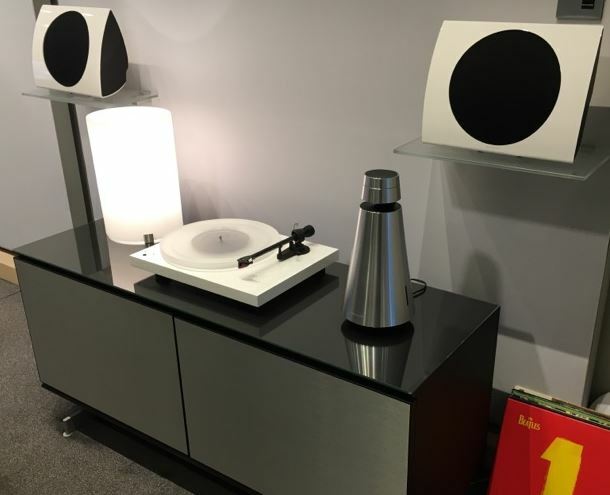 Although we’ve always been fond of Bang & Olufsen’s Play line, this was our first experience with B&O Proper. Believe it or not, this is one of the more affordable speakers in B&O’s product line. At one time, we may have scoffed at the idea of purchasing a speaker that cost as much as a new car. But after hearing the BeoSound 1, we feel as if we’ve been given a hint of what’s possible with properly designed speakers. The control dial on the top of the speaker is easy to use. You tap it to turn it on, and the single LED light will illuminate to indicate power. Rotating the wheel clockwise turns the volume up, and counterclockwise turns it down. This is fine to quickly adjust the volume, but for more advanced controls you need to use your smartphone. In fact, the B&O BeoSetup app is a requirement to get the speaker up and running. After installing the app on your IOS or Android device, you’ll want to select your WiFi network and enter the password. The speaker can operate over Bluetooth, but only WiFi can provide the massive bandwidth required for lossless audio. From here, the BeoMusic app enables you to put the speaker to work. You can stream music directly off the music library of your phone, or connect it with any of the services available. Spotify Connect, Deezer, and TuneIn radio are all built right in. If you have files shared on a computer attached to your local network, NAS drive, or on a remote file server, these can be accessed from your smartphone. If you’re an audiophile, you’ll appreciate that the BeoSound 1 has a high-end DAC installed, allowing you to stream your 24-bit/192kHz FLAC or uncompressed WAV files, which are currently the highest standard available. Support for these files isn’t commonly found in speakers, but very few speakers are powerful enough to explore the possibilities of the format. For simplicity, the BeoSound 1 can also connect to any Bluetooth, AirPlay, DLNA, or GoogleCast device on your network. Although these protocols don’t take full advantage of the speaker’s potential, their support means that the BeoSound 1 is compatible with almost any wireless device on the market. This is a semi-portable speaker. While you’re not going to chuck it in your backpack and take it to the beach, you might want to move it throughout your house, and you might not want it to be tethered to the wall at all times. B&O has included a lithium ion battery inside, enabling you to enjoy it for up to 16 hours before you’ll want a recharge. This time frame is only possible at moderate volume. Think dinner-party volume. As long as you can hold a conversation over top of the music, you’ll be fine. But amplification power is a logarithmic function – meaning it takes 10 times the power to double the volume. At full blast, the speaker only last four hours. That being said, it’s going to be the loudest four hours you’ve ever experienced. Some of you might not want to move your speaker around. If you’d prefer to move from room to room, with your music following you seamlessly, you might be interested in using the multi-room feature of the BeoSound app. This allows you to pair multiple BeoSound speakers (any of the new models will work) and control them all from a single point. You can hook them all up to the same source for a house party, use them separately, or transfer your music from one to the other as needed. When you get into the upper echelon of audio equipment, you can’t really describe it as “bad” or “good.” The speaker’s performance becomes a subjective matter. If nothing else, the BeoSound 1 speakers are unique, and you’re expected to pay for that experience. B&O didn’t just price their speakers on the sound quality, they priced them for the appearance and prestige that comes with a BeoSound speaker. If the only thing that you care about is sound quality, you’re not going to find value in the BeoSound 1. The B&O BeoSound 1 is unlike any wireless speaker we’ve encountered. From the eye-catching design to the unique acoustic properties, we didn’t feel as if we were buying a speaker. We bought an experience. If you’re shaking your head while reading this, we only ask you one thing – go listen to one. Luxury audio is an addictive hobby, and just one track on the BeoSound 1 will show you why. With that in mind, we’re not sure that we’d want the BeoSound as the only speaker in our home. They’re incredible for music, but simply unsuitable for home theater. If you’re looking for a premium sound system and don’t feel that the BeoSound 1 is for you, you might want to consider something a little more unbiased. The Bose Lifestyle 600 series home entertainment systems are a little more standardized, providing premium sound for almost every application. 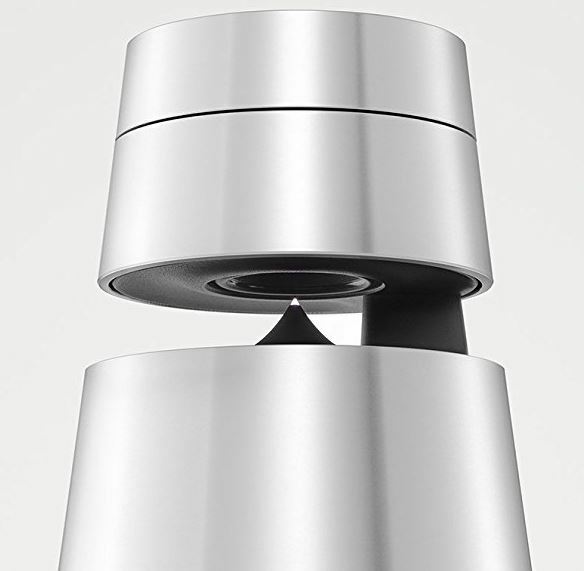 Alternately, maybe you like the idea of the BeoSound 1 but can’t justify the price tag. Although it’s in a totally different ballpark, the BeoPlay M5 is an impressive portable Bluetooth speaker that gives you a taste of that signature B&O Sound.